Filmmaker Terry Zwigoff is still best known for his documentary feature, Crumb, despite the fact that it premiered way back in 1994. Since the success of that film, Zwigoff has branched out to fictional films as well, shooting the excellent Ghost World, hilarious Bad Santa, and underrated Art School Confidential. While he hasn�t made a film since 2006, what better time than now to look back on Zwigoff�s first film, the documentary Louie Bluie. Made in 1985, Louie Bluie chronicles the late Howard Armstrong, an eclectic figure, to say the least. 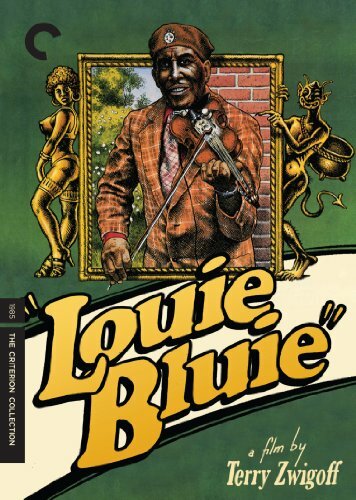 A virtually unknown work, pre-Crumb, Louie Bluie can now be enjoyed by all thanks to this excellent Criterion Collection DVD. Howard Armstrong was born in 1909 and spent the best years of his life (his twenties) in Chicago, where he flourished as a musician. When we first see Zwigoff with Armstrong in the film, he�s living alone in Detroit. Throughout the short, one-hour running time, we journey back to Chicago with both Zwigoff and Armstrong, so the latter can essentially relive his glory years as he�s well past 90-years-of-age. He�s soon reunited with much of his band, even performing at a handful of clubs in the Chicago area. We then follow Zwigoff and Armstrong to Tennessee, where we meet the former musician�s family and learn more about the area�s string bands and where he fits in amidst that world. Louie Bluie is a brisk, entertaining film that is only an hour long. So Zwigoff covers so much ground in that scant running time, though, that it seems like the perfect length. We learn a ton about both Armstrong and his music, and seeing him in action on stage is the icing on the cake. Zwigoff doesn�t simply rest on his laurels and show us typical concert footage, though, as he gives us a great, detailed look at how Armstrong performs. This decision to showcase his technique makes Louie Bluie both enthralling and educational. Now, I�m not going to even attempt to pick up an instrument and become the next Howard Armstrong, but seeing the effort and skill that goes into such a craft is beyond fascinating. Listening to Armstrong talk is just as compelling as the musical sequences, though, as he is a truly funny man that�s nearly impossible to turn away from when he�s speaking. He has an unending wit and charisma that is extremely unique, making it all the more positive that Zwigoff chooses to keep himself in the background and just let Armstrong be Armstrong. So many documentary filmmakers today can�t help but dominate their own films, whether via voiceover or an overabundance of screen time, but Zwigoff�s restraint in that matter is a huge plus for the film. Despite its relative obscurity, Louie Bluie comes to DVD from The Criterion Collection, and it�s another stellar effort from them. For a 16mm film shot in the mid-80s, it�s pretty amazing just how good things look. The original mono audio track isn�t as much of a pleasant surprise but it�s more than suitable for this material. An excellent extras collection is buoyed by not only an entertaining audio commentary track by Zwigoff, but also by an extra 30 minutes of footage that was left out of the finished film. This extra look at Armstrong, his music, and his life only adds to the already wonderful cinematic experience that is Louie Bluie.